We are able provide you with the original manufacturers security code required to activate your Suzuki car radio after power loss. Its fast and easy to obtain the radio code for your Suzuki stereo, simply follow the 3 simple steps on the right. Never take the serial number from any printed paperwork or user guides, since this may not match the actual Suzuki radio fitted to the car. Instead, take the serial number from either a label or an engraving on the top or side of your Suzuki stereo, to ensure the supplied Suzuki radio code is accurate. Illustrations © ASW Solutions (UK) Ltd, All rights reserved. First remove the radio from the car. Our removal guides should help with this. Once you receive the code, you can use our Free Radio Code Entry Help section to assist you with entering the code. Using our Suzuki stereo code service, you will not only be saving yourself money, but also the additional time which can be involved in trying to get your code from a vehicle main dealer. Most main dealers will request that you first book in your car with them, along with having to take proof of ownership along before they apply for your Suzuki code. Under most circumastances the code they supply will be derived frome either the vehicle registration or the Chassis number. If the radio has been replaced at any stage in its lifetime, this will be the incorrect code. The existing unit was changed under manufacturer warranty. The car radio was changed for an improved model, i.e. tape to CD player. A used car dealer changed the unit before selling the vehicle. 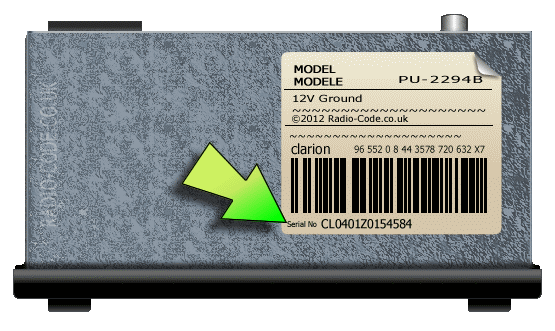 At Radio-Code, we provide radio codes based on the unique serial number of your unit. Our stereo codes have proven to be more accurate because of this. week and can't seem to find the code. Thanks! Just wanted to say a quick thank you! My parents car unexpectedly needed a new battery which left them with the radio needing a code that they didn't have! So having driven 250 miles to visit me it was superb to be able to get their unlock code from your site before they left to drive home! Within moments it was all working again! So I thank you, as does my mum and I'm certain Dad does too! It worked a treat!! Thank you for a super service.